Supercrease® is 'The' permanent crease for clothes, we are the founder of the innovation, developed and launched in 1976. It is a method of creating a permanent crease by applying a specially formulated line of resin to the inside crease of a pressed garment. It is a globally recognised and an internationally patented product. Number one Supercrease® is the most profitable add-on in the clothing industry. 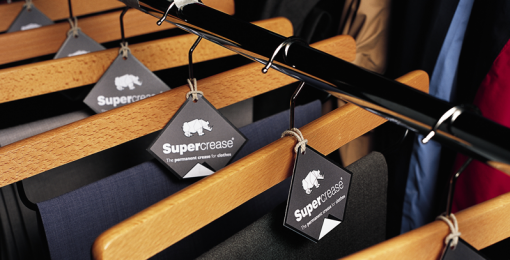 Easy application Supercrease® can be added to any garment in under 1 minute on your shop floor. Small equipment It takes up the space of a regular household ironing board. Customers are our top priority We offer a comprehensive support package, full set-up, training and marketing guidance. Safe and biodegradable Supercrease® is certiﬁed by the Hohenstein Institute and is Oeko-tex accredited.